It has been a long time! I haven’t posting anything on this blog or my other, more general blog, Jack’s Blog, since last May and knew before giving up this thing that I would give it at least one more shot. That’s when–only a few minutes ago–I stumbled across ToadMama’s Brave, Bold Blogger Challenge. So, I will use this fortuitous CHECK event to launch another (last?) attempt at journaling my life on my Vespa. 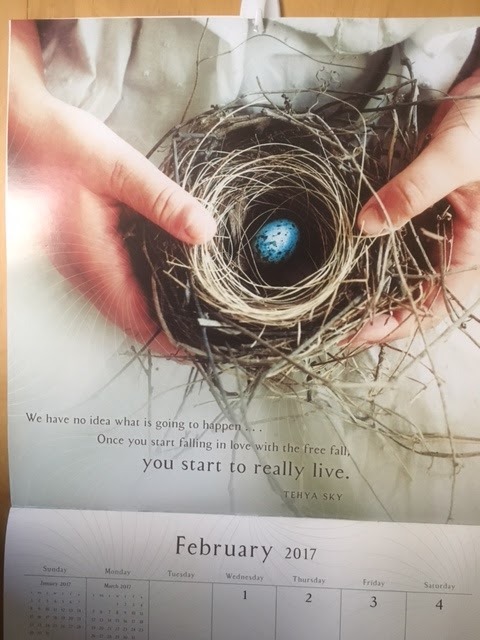 Since I stopped blogging I have been trying to go easy on the burgers so there has been little to chat about in that order, but check out the image on February’s calendar just to the right of where I am typing! Ooh, pretty blue egg! Wonderful contrast to the rustic nest. There is also a quote from inspirational author Tehya Sky: “We have no idea what is going to happen… once you start falling in love with the free fall, you start to really live.” Since I’m starting this challenge late I’ll be doubling up on my posts to catch up. Too, I’ll be doing these twenty-eight subjects outlined by ToadMama out of sequence–hence starting at the end here.